NETWORK FINALS: The PENN & TELLER: FOOL US rerun dropped 0.1 in final numbers. CABLE HIGHLIGHTS: Discovery had the #1 and #3 slots on Friday cable with GOLD RUSH at 0.72/0.53, respectively down 0.13/0.04. A&E’s LIVE PD dropped 0.09 to 0.64. ESPN’s NBA doubleheader was at 0.47/0.46. The budget issue was good news for CNN, which topped cable news with the midnight hour of CNN TONIGHT at 0.45/0.59/1.5M, over MSNBC’s RACHEL MADDOW SHOW at 0.33/0.49/3M and Fox News’s TUCKER CARLSON TONIGHT at 0.32/0.57/3.3M. HBO’s REAL TIME WITH BILL MAHER returned at 0.42, and served as lead-in to the season premiere of HIGH MAINTENANCE at 0.12. Nickelodeon’s 6PM LOUD HOUSE was at 0.40, and lead-out ADVENTURES OF KID DANGER was at 0.34. MTV’s RIDICULOUSNESS was at 0.36/0.29, compared to last week’s 0.35/0.35, and AMAZINGNESS was down 0.04 to 0.24. On Lifetime, THE RAP GAME gained 0.03 to 0.34, and BRING IT was up 0.03 to 0.32. On HGTV, MY LOTTERY DREAM HOUSE crashed by 0.15 to 0.31, HOUSE HUNTERS fell a tenth to 0.31, and HOUSE HUNTERS INTL was down 0.05 to 0.30. 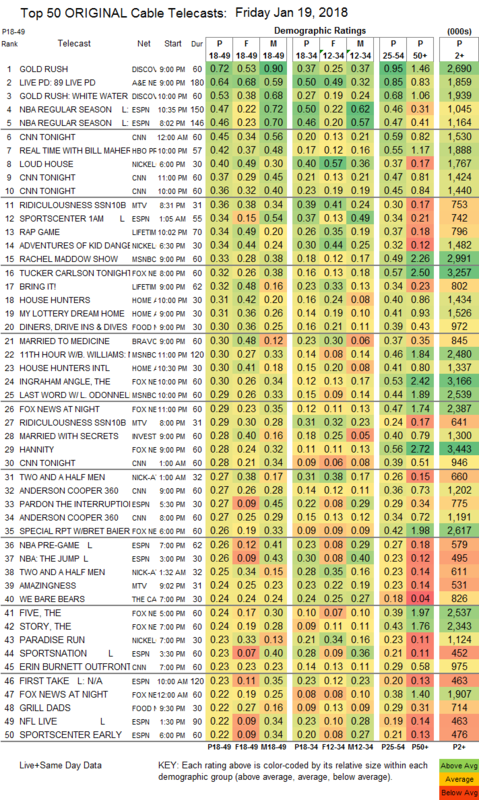 Food Network’s DINERS, DRIVE-INS & DIVES was at 0.30, and GRILL DADS was down 0.02 to 0.22. Bravo’s MARRIED TO MEDICINE was steady at 0.30. ID’s MARRIED WITH SECRETS edged up 0.02 to 0.28. TLC’s MAMA JUNE: FROM NOT TO HOT dropped 0.07 to 0.21, and LOVE AFTER LOCKUP was at 0.15. 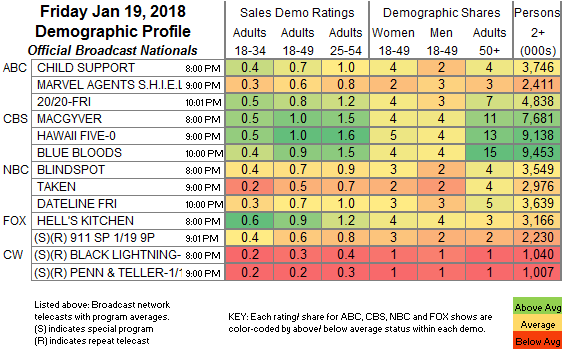 TLC’s UNKNOWN STORIES OF THE ER lost 0.06 to 0.19.